My content instructional goal this week was centered around the rise of empires in the post-classical era. Not any different than last week, but I am looking at other empires. There are a lot of different empires in the post-classical era. My skill instructional goal was centered on document analysis, contextualizing a prompt, and using evidence to support their claim. The students displayed their understanding of the documents through a document based question. This skill has repeated for the past six weeks. That was very intentional. How do I know the students learned and how do I know if they know what they were supposed to learn? This week was a bit of a challenge. The students went on an all sophomore college visit in the middle of the week. But there is still some great evidence to support my outcomes. How do I know the students have learned? The writing this week was amazing. 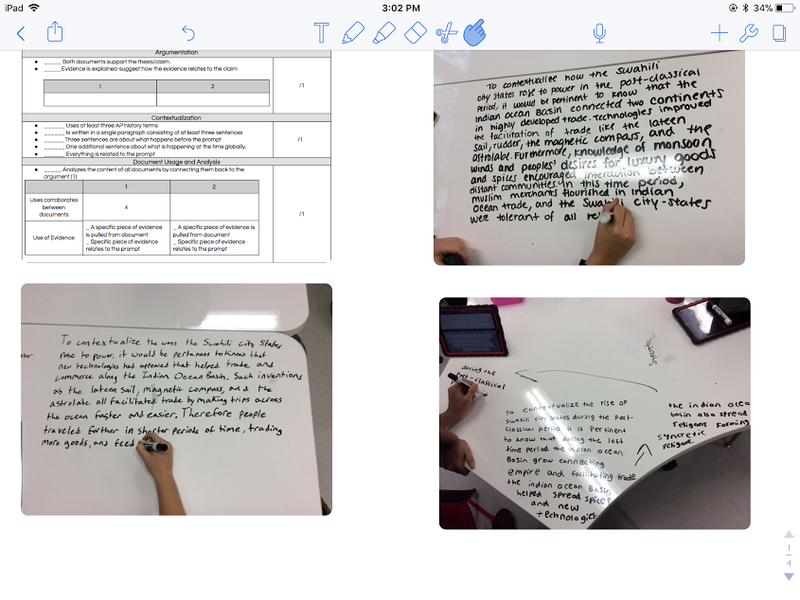 In the two examples below, the students pulled evidence from two documents to support the thesis. As for the contextualization skill, the students contextualized the rise of all the different empires. 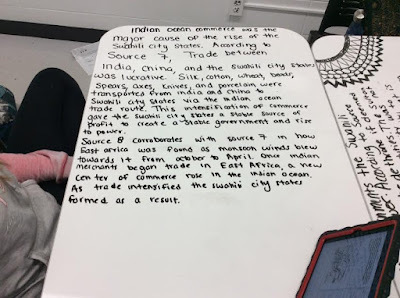 In the example below, the students contextualized the Swahili City-States. How do I know if they know what they were supposed to learn? In the example above, I took three samples throughout the day and put them in a Notability document with a rubric. In front of the whole class, I modeled how to grade one. Then they graded the other two to see if they could recognize mistakes or evidence of mastery. They evaluated the three samples and then I revealed how I would have graded it. Then they assessed their own writing. As for the content, the writing in each of the above samples showcased a deep understanding of the rise of empires. 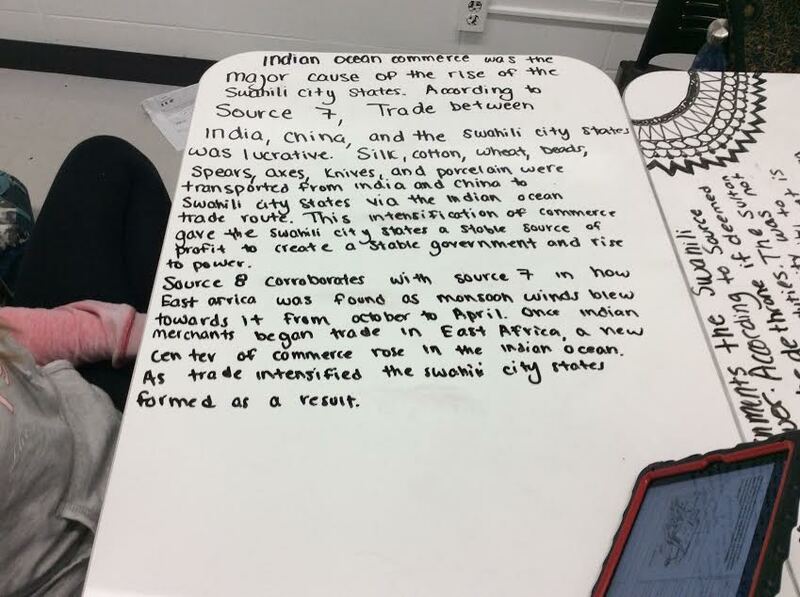 The students used specific evidence on the rise of the empires. In the second picture, the student cited how the lucrative Indian Ocean trade helped the rise of the Swahili City-States. The author goes further and justified their argument with eight details! Here is the rubric that I am using for this unit. It will grow throughout the semester. Right now I am only concerned with the students using two documents. Therefore the rubric has been paired down. I constantly display student samples. Every day I showcase multiple models and evaluate it. The students are peer and self-evaluating daily. This daily process has led to improvement in writing in the samples above. Their writing is using specific evidence beyond what is expected. Eight details are unbelievable. According to the rubric, they only need one specific piece of evidence. For a student to eight, is exceeding the expectation. I am glad I took a picture to document the mastery. Additionally, they are linking their evidence back to their thesis statement. Not all of the students can do the later part yet. That is an incredibly difficult skill. But they are making progress. They are beginning to have the documents "talk" to one another. They are using the documents together to build an argument. Their writing is beginning to become sophisticated. In the samples above, the students are seeing the connections between evidence and recognizing that not all evidence is equal. Some evidence needs extra support and when brought together with other evidence, it is much stronger. As for contextualization, they are amazing! This has been one skill that they continue to impress me. They have to situate the prompt in context. To do this, they must recall pertinent information from the past to help understand the present. That in of its self is challenging. To be able to express that in writing is harder. But in the examples above they are doing it! Furthermore, they know how to do it and cannot recognize good and poor samples. I have stated in previous blog posts that I can get lost in the curriculum. Sometimes, when I am teaching it can be difficult to recognize when progress is being made. This weekly blog has forced me to recognize their improvements. They are getting so much better at reading and writing. Their content knowledge impresses me. They are not perfect and there is a lot of work ahead, but they have improved. What impresses me the most is their ability to recognize when their writing is on target and not. Slowly, they need me less to evaluate and confirm what they already know. Because the process of writing, showing samples, and peer/ self-evaluating takes place daily, it is ingrained in them. I don't have all of the answers nor do I profess to have them. But the great thing about this process, I am learning alongside them. AP is tricky and there is not one right way to write. The more I read students samples and work alongside my students as they learn to write, I am shaping my own understandings of what mastery is. I have a better understanding of what is expected and they can relay that information to the students in hopes to get them to recognize it as well.